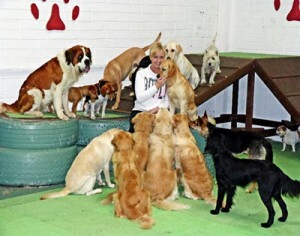 At the Dog Ranch we provide the perfect solution for dogs and their owners. Our state of the art training and behaviour centre in Cavan runs Doggie Day-care Monday to Friday which has become a popular choice for owners, a plush Doggie hotel as an extension of Day-care which is open all year round located at our home giving your dog a stress free ‘Home from Home’ while you are away. We run training classes, agility for fun, and one-2one behaviour consults in your home all tailored to your specific needs. Our Puppy Play & Stay School gives pups a great head start in life. Our aim is to fulfil the needs of dogs and their owners while helping owners understand their dog better and communicate with them in a canine language. invaluable social skills and how to interact safely with people and their own kind. We make training fun and promote good behaviour and is why Doggie Day-care at The Dog Ranch is such a popular choice amongst owners. Owners have notice a huge improvement in their dog’s concentration and behaviour. When they are out walking, their dogs are now longer barking crazy at other dogs showing that a well socialised dog is a happy and balanced dog. 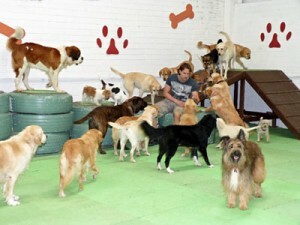 The Dog Ranch is run by husband and wife team, behaviour and Training Specialists Keith and Rhonda Irwin. ’Dogs are a way of life for us and we believe in knowing each and every dog in our care to the fullest. Being owners of 8 wonderful dogs we understand the worry & concern every owner feels when having to leave their beloved behind. We build up a strong bond of trust with every dog that comes through our doors. Dogs attending our Doggie Day-care and boarding are not just numbers to us, each one is an individual whose trust must be earned and shown respect. With this in mind you will never have any strangers looking after your nearest and dearest as we are with the dogs in our care at all times. We treat every Dog Rancher as part of our family.